We’ve recorded each scenario so you can follow along with the lore! We’ve also datamined and added the related quests to our database, so you can leave comments and tips on how to complete them. To start each scenario, you must have met the unlock requirements for that faction as well as pre-purchase of Battle for Azeroth. In the datamined recruitment quest dialogue, we learn that the Void Elves have been exiled from Silvermoon–their magic makes the Sunwell unstable. Alleria tracks down Magister Umbric and his Void Elf followers through Ghostlands, eventually meeting him and saving the elves from Nether-Prince Durzaan. Alleria promises to train the elves to control the Void if they pledge their allegiance to the Alliance. The Lightforged Draenei are Elite Draenei fighters that decided to join the Army of the Light originally to fight the Legion. Now, with the threat subsided, they return to Azeroth, joining their fellow Draenei in the Alliance and have started training the next generation of defenders of the Light. In their introduction quests we learn more about this training process. The Nightborne were once Night Elves, Highborne that lived in Suramar at the time of the Great Sundering. During the Sundering, they used the magic of the Nightwell to isolate themselves from the outside world, as they believed it had destroyed everything outside the city. For 10,000 they remained unseen to outsiders, until their former leader, Elisande struck a deal with Gul’dan and pledged allegiance to the Legion, lowering the shields protecting the city and exposing it to the outside world. In the datamined recruitment quest dialogue, First Arcanist Thalyssra reminisces that the Night Elves still do not fully trust the Nightborne after their previous allegiances with the Legion both in the War of the Ancients and early in Legion. Tyrande’s mistrust drives First Arcanist Thalyssra to form a bond with the Sin’dorei and the Horde. The Highmountain Tauren were first introduced in Legion, in the Highmountain zone. They are Tauren descended from Huln, dedicating their lives to protect his legacy in Highmountain. What starts as a simple celebration feast turns into an elaborate battle against the presence of the Old Gods. 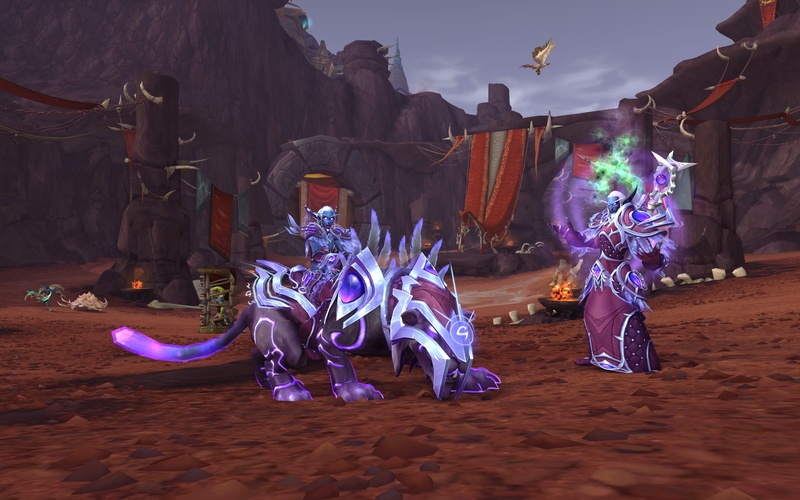 How did it feel to make the Allied Race scenarios and quests where there are new faction lines and conflicts, etc, after a whole expansion of everyone working together against the Legion? It’s cathartic after all the hand holding and working together! Nice to be reminded of why we’re proud of our factions and that means inter-faction fighting! Lots of discussion about Nightborne joining the Horde. Thoughts on that and Thalyssra’s grudge? From far away you’d think they’d join the Alliance because of how close they are to the Night Elves (same with Void Elves and Horde) but that’s not how it turns out. That’s what’s cool about the unlock scenarios, you’ll find out the specific reasons WHY these factions and faction leaders make those decisions – a cool story twist!